Earlier today, Jinder Mahal had a photo shoot with the WWE Title. Shane McMahon shows up and takes the belt from him, saying Mahal hasn’t earned it. Shane McMahon heads to the ring. Shane welcomes the newest member of SmackDown Live, the new US Champ Chris Jericho. Jericho is happy to be on SMackDown, and Shane says everyone is happy to have him. Shane also tells Jericho that he will be defending the US Title tonight in a rematch against Kevin Owens. AJ Styles then decides to head to the ring. Styles informs Jericho that he’s standing in the house that AJ Styles built. He also tells Jericho that he would love to take away his US Title, if he’s still champ that is. Jericho reminds Styles that he made KO TO, and Jericho is the new “face of America.” For questioning if Jericho can beat Owens again tonight, Jericho gets ready to put Styles on The List. Before he can, Owens comes out. Owens says what’s happening in the ring is the most pathetic thing he’s ever seen. None of it matters. Tonight, Owens will take back his title. Owens tells Styles to get out of his ring, so he does. Styles heads right to Owens on the ramp and attacks him. They brawl as the segment ends. Not a great match. It wasn’t terrible, but there seemed to be a few hesitations, and there was an ugly looking tornado DDT late in the match. The rest of the match was okay but unsurprising. It was pretty easy to predict exactly how this match would play out considering the position Mahal is in right now. Becky Lynch encounters Tamina, James Ellsworth, Carmella, and Natalya in the hallway. Natalya again tries to recruit Becky to join their team. Carmella offers to watch Becky’s back. Becky says she’ll think about joining. Dolph Ziggler watches a highlight package for Shinsuke Nakamura on one of the monitors. Dolph complains to the people around him that Nakamura hasn’t even proven himself in the ring on SmackDown yet. Shane McMahon stands behind, listening, as Dolph complains about Shane and Daniel Bryan building a PPV around Nakamura. Shane tells Dolph that Nakamura introduced himself to Ziggler last week, and Ziggler says he was very impressed. By his entrance. Aiden English, in the ring, calls for a spotlight and sings about himself… until Tye Dillinger’s music interrupts him. This was practically a squash. Aiden was angry and started the match quickly, but that just seemed to fire up Dillinger who made quick work of English. Renee Young asks Chris Jericho how he’ll take back his title when Aiden English walks by. Jericho sees that English is crying, and for that, English makes The List. Renee also makes the list, for no apparent reason. Dasha Fuentes welcomes Charlotte Flair. Charlotte says the “welcoming committee” only stopped the inevitable last week. Carmella, Natalya, and Tamina walk up and attack Charlotte, leaving her lying. I liked the match. Naomi looked very good and strong in this one. I particularly liked the work she did with Carmella here. Naomi started alone, making the first half a handicap match, but Charlotte eventually joined her. Charlotte added somewhat to the match, but the condition she was in from the pre-match beating kept her from doing a lot. This finish to this was expected, but nicely done. After the match, Natalya and her team attack Naomi and Charlotte. After a few seconds Becky Lynch comes out and walks to the ring. Becky takes a few seconds to decide, then chooses to side with Charlotte and Naomi (after a brief tease of the opposite). Becky brawls for a bit, but she’s stopped by a big kick from Tamina. Natalya, Carmella, and Tamina stand tall in the ring to end the segment. New Day is headed to SmackDown. Soon. Still. An okay match. Sin Cara seemed a little off at times, though he did pull off a nice one-armed lifting powerbomb. Ziggler looked good, though this match felt like a warmup for him. Noam Dar hasn’t been the same since Alicia Fox dumped him, but tonight, he will deliver a gift to Rich Swann. The Fashion Police (Breezango) work on a new case: The Uggos. Good match. Their match at Payback was better, but this was quite good as well. The last segment got pretty brutal, starting with Owens hitting Jericho with a DDT on floor. That led to a very convincing finish a few minutes later. 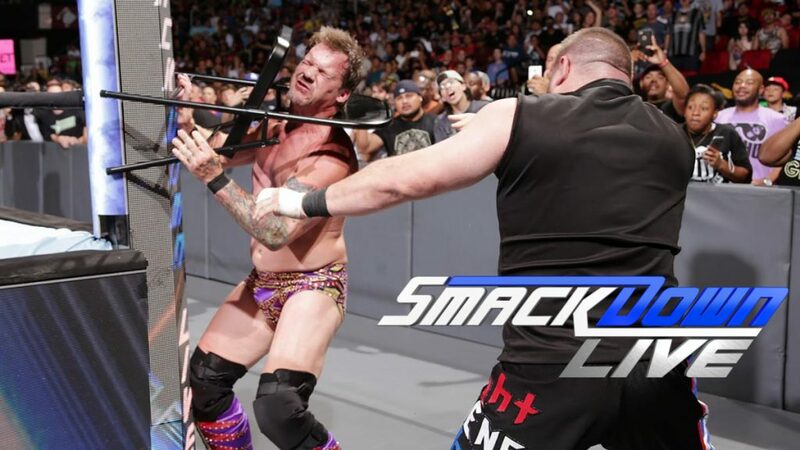 Paramedics tend to Jericho, but Owens returns to the ring and attacks Jericho. He hits another pop-up powerbomb and starts to walk away. Jericho is helped towards the ramp, but Owens returns and renews his attack. He wraps a chair around Jericho’s head and runs him into the ring post. This wasn’t a great show, but the Owens/Jericho stuff, all of it, made this a decent show. None of the other matches came close to this one.